Before I started reading books by Thomas Frank, I thought maybe I had slept through the 80s and 90s, especially as I listened to the Republican rhetoric in this ‘Ronald Reagan was the greatest president’ era. I thought I remembered, Reagan — and both of the Bush presidents for that matter — driving up the national debt, increasing the federal deficit and being unable to balance a budget. Turns out I remembered correctly. 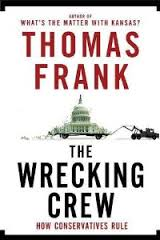 In The Wrecking Crew: How Conservatives Ruined Government, Enriched Themselves, and Beggared the Nation , Frank takes a hard, uncompromising look at the cronyism that came to define the conservatism movement and how government became inept because of it. In example and example, Frank views historical moments — current events that most of us remember — and shows what occurred on stage and behind the scenes. Disasters like Hurricane Katrina and the fumbling government response by the head of FEMA — and George W. Bush’s crony — Joe Allbaugh. Allbaugh was appointed to the position despite the fact that he had no experience in anything remotely akin to responding to a disaster. But, examples like that are old news, so it’s Frank’s piecing together of some of the lesser-known events and persons that makes the book such an interesting read. Frank devotes an entire chapter to one of America’s most powerful groups — lobbyists, showing what they have accomplished in Washington D.C. since the early 1990s. 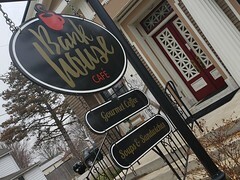 Embarking on the time period filled with the righteous indignation of Newt Gingrich and the Freshmen Class of 1994, Frank unveils the agenda of Indiana freshman Republican David McIntosh. McIntosh is ready to face this lobbying problem head-on, well sort of, by trying to get a bill passed to ban lobbying — at least by certain groups. Of course, as the book points out, the idealistic, anti-lobbyist McIntosh became a lobbyist the year he left Congress. What I like about Frank is the amount of research he does for his books — the breadth and scope of his reading must be enormous — as can be seen by the somewhat obscure examples he uses, including this one which he uses early on in the book. He opens a scene with an example from a 1945 children’s book. The book explains all the good that can come from a single dime when coupled with a benevolent government. The 1945 dime was all about service, so Frank modernizes the story, showing how a privatized and outsourced government creates a dime that is all about profit. And as Frank shows — with plenty of footnotes for the doubters — this new model of selling off government to the highest bidder has cost the American worker more than just the equity in their homes — or a Great Recession. It costs them their voice in government. Rated 4.5 out of 5. The only reason I don’t give this book 5 stars is because it is so fact-dense (which is a good thing) that the notes and footnotes tend to slow the reader down.